Considering serving that special slice on an all-purpose plate? Fuggedaboutit! This triangular stoneware plate comes at that piece of pie from the right angle. Whether you're devoted to deep-dish or the New York slice, this three-sided dish is designed to accommodate any version of the Friday night favorite. From the crust-hugging curved end to its tapered point, it slides beneath slices with ease, making a speedy delivery to your taste buds that much simpler. Made in China. Microwave and dishwasher safe, not oven safe. These plates are so much fun. My mom always is ordering out pizza (who has time to cook) and now she can serve those slices in style. She loved this present and I'm so happy that I found a unique gift to give her this year. I sent it as a thank you present to my sister and husband. They were thrilled with the surprise, loved the fun idea and said it holds a generous slice of an extra-large pizza perfectly. Used these plates to serve pizza. Using the plate wasn't convenient if you wanted to hold it because point of plate was aimed at your heart. Plates are very nice looking and I'm sure I'll be able to find another use for them. I bought these for fathers day not really knowing what to expect and I was pleasantly surprised. They have a great weight to them and the coloring is sharp. Great gift!!! Another gift for a family member that orders out for pizza slices every Friday :) I was so excited when I found this and he absolutely loves these plates! They are a very heavy, high quality glass and they look really great too. 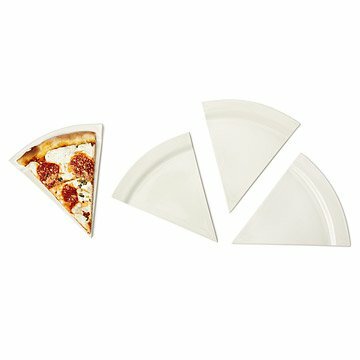 Perfect fit for a perfect slice of pizza! Can pizza be anymore fun? Too cool! Just when I thought pzza couldn't be anymore fun, it can! This triangular ceramic plate comes at that piece of pie from the right angle.